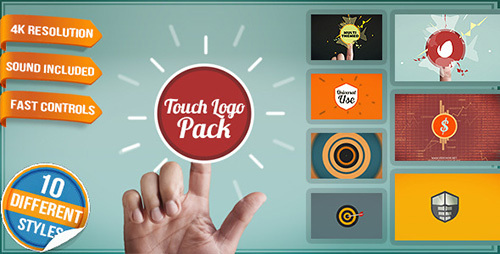 Touch pack is presenting your logo in new modern innovation flat style! User Interface becoming more flat, fast and simple in whole media and is demanded to be responsive, with this touchscreen hand motion pack you can be effective in multiple logo themes. Use this short logotype intro opener for your mobile app, entrepreneur, seo, target, glitch, security and technology themes! Main thing in these is simplicity and clean style. 10 Different animation reveal styles for different needs! Simple to change and modify even further! Choose your colors and create your own style! Many different themes can be covered, from entertainment applications, to mobile banking, finance and economy, also flash and unity internet browser web game intro, app store, startup project. Mainly these logotype animations fits modern themes for tablet and mobile devices.